Firstly, I lined 2 sandwich tins and preheated the oven to 180ºc. Melt the dark chocolate then leave to cool, ready for when it needs to be added to the mixture. Then cream together the margarine and sugar, and add a pinch of salt. Sift in half of the cocoa powder and half of the flour. Add the eggs one at a time, then fold in the rest of the cocoa and flour, before mixing in the melted chocolate. Add the milk a bit at a time, then mix in the marshmallows. Split evenly between the two tins and bake for around 30 minutes. Once done, leave to cool. To decorate the cake, I made a standard chocolate butter cream icing to go all around the cake, on top and between the two layers. However, to make it even more gooey and indulgent, a smooth chocolate ganache might work even better. 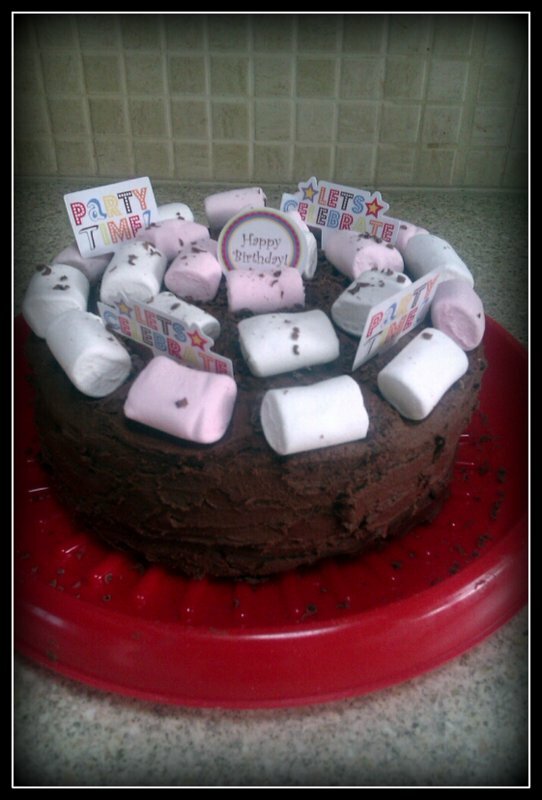 I finished the cake off with marshmallows and birthday decorations.